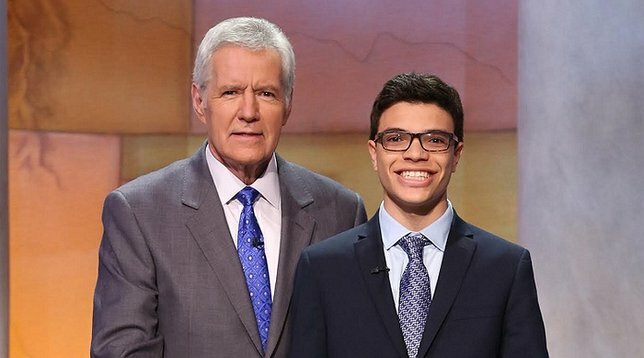 Alec Fischthal, a junior at George W. Hewlett High School in Hewlett, N.Y., to compete in the two-day finals of the ‘JEOPARDY!’ Teen Tournament. Alec Fischthal is a junior at George W. Hewlett High School in Hewlett, NY. Photo by: Jeopardy Productions, Inc.
Hewlett, NY - November 21, 2016 - Alec Fischthal, a junior at George W. Hewlett High School in Hewlett, N.Y., to compete in the two-day finals of the ‘JEOPARDY!’ Teen Tournament on Monday, November 21 on WABC-TV. Watch Fischtal compete on JEOPARDY! on WABC-TV (ABC). Please check your local listing for additional information or visit Jeopardy.com. JEOPARDY!, America’s Favorite Quiz Show®, and its host, Alex Trebek, are in their 33rd season in syndication. With 23 million viewers each week, JEOPARDY! is the top-rated quiz show on television, and has won several awards and distinctions over the course of its 30+ years on the air, including setting a Guinness World Records® record for the most Emmy® Awards won by a TV game show (33 Emmys). JEOPARDY! is produced by Sony Pictures Television, a Sony Pictures Entertainment Company; Harry Friedman is Executive Producer. JEOPARDY! is distributed domestically by CBS Television Distribution and internationally by CBS Television International, both units of CBS Corp.
Subject: LongIsland.com - Your Name sent you Article details of "Tune in for the 'Jeopardy!' Teen Tournament Two-Day Finals Today - November 21"